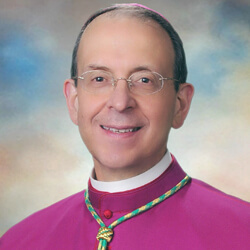 As Archbishop of Baltimore and as an alumnus of Mt. St. Mary’s Seminary, it is a particular joy and honor to celebrate this Holy Mass marking the 60th anniversary of Mt. St. Mary’s National Shrine Grotto. In a special way I want to recognize the leadership and support of President Trainor, the tireless efforts of Lori Stewart and her team to foster this place of renewal and refreshment, the devoted service of our chaplains, Fr. Daniel, Fr. Ted, and Fr. Alberto, and, of course, the continued support offered by the Seminary, represented today by Msgr. Baker and other members of the seminary community. Allow us all to thank you most warmly for all the ways you lead and support this ministry! It is also a ministry near and dear to my heart. Way back when, when I was a seminarian here at Mt. St. Mary’s, the Grotto was under the direction of Msgr. Hugh Phillips whom we remember today with deep gratitude and much affection. No one was more devoted to the Grotto than Msgr. Phillips. Thanks to his efforts support was found to transform what had been a private grotto – dating to the early 1800’s – into a public place of pilgrimage for the faithful of the United States and beyond. But that didn’t make Monsignor a particularly good driver. When he piloted his very large red Buick Electra around the campus and the Grotto, we seminarians knew that it was in our best interests to get out of the way. There’s even a story that at one point, the Buick, with Monsignor still in it, was perched precariously on the side of the mountain, but that’s probably the stuff of “urban legend”! The real point I want make here is the debt of gratitude that we owe to Msgr. Phillips in making this Grotto a place of pilgrimage, now a national shrine to which some 400,000 pilgrims stream each year. As a first year seminarian, my classmates and I would greet busses that would arrive here at the Grotto on Sunday afternoon, from Baltimore, Washington, New Jersey, Pennsylvania, and beyond. We welcomed the pilgrims as they disembarked, gave them a tour of the grotto and the cemetery as well as other points of interest, and, as part of our early training, were told to make sure they left behind an offering. As time went on, however, I would find myself drawn to the Grotto to pray, to spend time, as I have at Lourdes itself, asking for graces I would need as a priest, and walking in the hallowed footsteps of St. Elizabeth Ann Seton, Fr. John DuBois, and Fr. Simon Brute, indeed, so many holy men and women who had gone before me in faith. In the solitude of the Grotto, I often prayed the Rosary, walked the Stations of the Cross, and experienced Mary’s maternal love. Much has changed, many improvements have been made (such as the beautiful Visitors’ Center), but one thing remains the same: the Grotto remains the same place of peace, holiness, and grace where Mary draws near to us in the purity of her love and intercedes for us with love beyond all telling. Today’s feast, the Birth of Mary, helps us understand why we are so drawn to Mary: she’s one of us yet she is so near to God, so special in his eyes. In today’s excerpt from the Gospel of Matthew, a long list of names familiar to us from the Old Testament was read. This reminds us of the sacred ancestry of Mary and Joseph, their descent from the House of David, their belonging to that remnant of Israel that hoped against hope in their longing for the Messiah, the Christ, who would with salvation for all. Mary’s parents, Joachim and Anne, also belonged to this remnant. This beautiful feast takes us into their home where she, who was full of grace from the first moment of her life, was taught by her parents how to pray and how to open her heart to the Word of Life, the Word of the Father. Indeed, that saintly couple cooperated with God’s grace in helping to prepare and to form the Blessed Virgin Mary who one day would conceive the Word in her immaculate womb. In their role as loving and faithful parents, Sts. Joachim and Anne played a unique role in preparing for that moment when “the Word was made flesh, and dwelt among us” (John 1:14). Every year, thousands upon thousands of pilgrims come her in search of Mary and in searching for Mary, they are truly searching for the Lord, for Mary always leads us to Jesus. So many of these pilgrims are looking for a new beginning in their lives. Perhaps they are asking for a new start in their marriages, or in their relationship with their children and other loved ones. Perhaps they are seeking a new beginning in their relationship with God, a newfound freedom from patterns of sinful behavior. Or maybe they simply want to pour out their hearts to Mary seeking the grace of God in bearing afresh the burdens and worries that beset them. All of us have come to this Grotto seeking, in one way or another, for new beginnings in our spiritual lives – and how comforting her presence is to us. 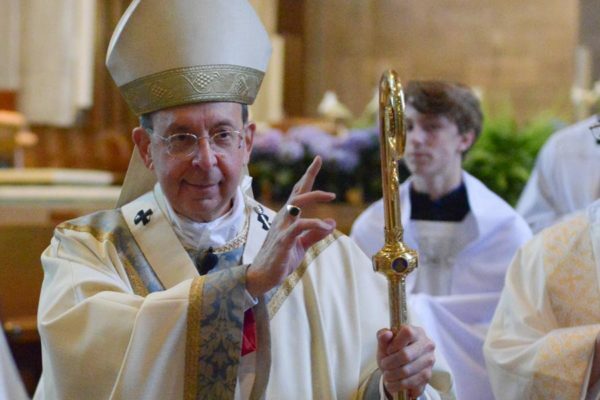 On this feast of the Birth of Mary and on this special anniversary of the Grotto, let us also come to Mary seeking a new beginning in the life of the Church in Maryland, in the United States of America, and around the world. Mary’s sinless birth is a sign of hope to us in these days when the Church herself is burdened and torn asunder by the sins of her shepherds. While there is much to account for and much work that still needs to be done, it is right and just for us to come to this Grotto to ask Mary’s intercession that the Church may be renewed and purified in this time of crisis. It is also right and just for us to ask Mary’s intercession for all those who have been harmed by the sins of the Church’s shepherds, that they may experience healing, reconciliation, and a new beginning in their lives. May Mary who is the Mother of Jesus and Mother of the Church, pray for us that we may find the path to discipleship, fidelity, and zeal for the Gospel. O Mary, conceived without sin, pray for us who have recourse to Thee!